This week we have a guest post from Lauren Burton. Lauren is the leader of the Find Your Mark Chapter in Nashville, TN, and she and her husband lead an annual team from their church to our Care Center to provide dental assessments for each child as well as complete manual labor projects at the facility. 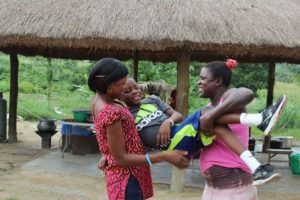 Her journey with Touch A Life began as an observer at a fundraising event, and now, three years later, she is an adoptive parent and a key supporter in our work happening in Ghana. 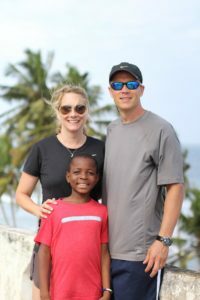 She recently traveled to Ghana with her husband, her son, Micah (who she adopted from Ghana), and her church team, and she has been sharing her experiences on our blog this summer. For the first part in this series, read A Return to Ghana. We had barely cleared the baggage claim area of the International Airport in Accra, Ghana, when my eight-year-old son, Micah, asked me this question. I laughed to myself, thinking that maybe this return to his native land would yield more understanding for him than I had anticipated. Case in point: for the past 15 months, all of our family members have kindly asked him to stop yelling at us. He always screams back, “But I’m not screaming!” We laugh and chalk it up to his cultural background, one where the volume level at which one speaks is much higher than it is for those of us from the States. Ghanaians are demonstrative people and they rarely hold back their feelings, often speaking rapidly and loudly. This was Micah’s norm. 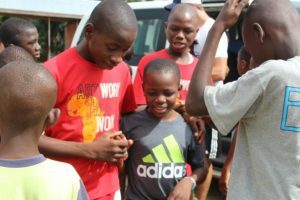 His ears have slowly become accustomed to the softer way we talk, though, and now, barely on the ground in Ghana for an hour, he was distressed at the seemingly violent discussion taking place between two men in the parking lot. I told him to keep his eyes on the men as we walked. Sure enough, they quickly parted company with a hug. He giggled in understanding as I made my best that’s-what-I’ve-been-telling-you-for-a-year face. As crazy as it may seem, that situation was the perfect way to set the mood for our arrival. God has been rubbing the type A-control freak dust off of me since the first time my feet hit Ghana’s red soil in 2011. This was a brief refresher course in the “We aren’t in Kansas anymore” filter I use for my thoughts when traveling in Ghana. This was now applying to Micah, too. If my son could see that his preferred way of communicating with strong feelings and loud tones may be perceived as anger, I could now see exactly why things always feel less complicated to me there. They are. And that is what this trip would ultimately yield for us: I would see things more clearly from Micah’s perspective and he could see things more clearly from mine. 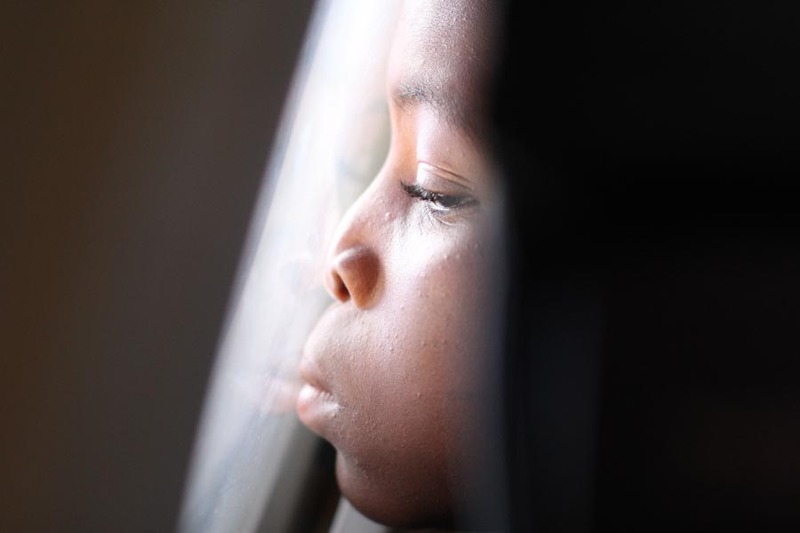 Micah’s return to the Care Center where he once lived was everything we could have hoped for. With shouts of jubilation and 47 sets of hands passing him through the crowd, he was greeted as a long lost brother. Two of the housemoms, Ma Paulina and Ma Evelyn, picked him up and nearly pulled him limb from limb in their excitement. When the expected teasing over his new accent brought him to tears on our first afternoon there, I shared the problem with one of the oldest boys. He took Micah by the hand and facilitated an instant resolution to the issue. It proved that there is no place for a hovering mother in Ghana. That was the last time I saw Micah sad until it was time to say our goodbyes. I’ve never seen him have so much fun. His mannerisms and laugh had an unaffected ease that I achingly realized I had not seen before. He and his two best buddies rarely left each other’s sides. He wandered our way only when it was time to eat lunch. Before we left the U.S., he had wanted a repeated guarantee that he could eat all his meals with his Ghanaian friends. A day after arrival, however, he declared the cooks had changed the way they made things and asked to eat the more American-style food they had prepared for us. He mischievously scraped together all the leftovers from every meal and snuck them out a side door to give his buddies. We pretended not to notice even when their giggles were blatantly giving them away. As afraid as I had been of a growing complex, where Micah returned to Ghana as an important dignitary and bestowed material goods on his brothers, we were actually quite surprised by the restraint he showed in passing out the collected treasures he had brought from America. I fully expected him to dump the whole load of treats in a matter of minutes. Instead, in our very last hour there, he realized his bag of goodies was still almost full. When I asked him about it, he said he had forgotten how much fun it was to run and play there and he hadn’t thought about his “stuff.” What a wake-up call. How do you keep a child previously unspoiled by the lure of material things from falling prey to your pointless pursuit of them? While this trip filled our hearts in many ways, it was this reminder I hope I won’t forget. The days went by too quickly as they always do when they are happy. We soon traded the joyful shouts of reunion for the gut-wrenching cries of departure. I am at a loss for any adjective that describes the sight of two 8-year-old boys holding tight to each other while sobbing painfully. It was the only moment the entire trip I doubted the wisdom of reuniting them. Again, however, as it has so many times before, Micah’s ability to process his situation and articulate his feelings about the experience surprised us. He was leaving with a renewed determination to make the absolute best of the opportunities he has been given. He expressed gratitude for his new life in the days and weeks following our trip that had never been verbalized to us before. Micah is definitely hoping to visit the Care Center again as soon as possible, but he returned much more resolved to his changed life than when he had left the States. Having a context for both parts of his heart has proved healing.